One of many critters that cause consternation for Darwinistas is that eight-legged octopus. How did it evolve, and from what? "Well, we think maybe, perhaps, could be..." Never mind. Octopuses were created to be what they are, and they didn't evolve, same as their nautilus cousins. Then you have the size range as well as variety. 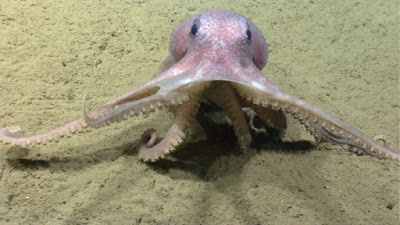 Octopus wolfi is about an inch (2.54 cm) long, and it has a cousin, the giant Pacific octopus, that has been measured at 16 feet (4.88 m) long. I bet those marine biologists get wrapped up in their work! It appears that all octopuses are venomous to some extent, but only the blue-ringed octopus is dangerous to humans. Just leave it alone and everybody's happy. Some new information has been ridden into the data corral, too. These cephalopods are intelligent as well as having unique survival abilities. Their genome was examined, and scientists were surprised to learn that its genome is long. In fact, it's about the size of the human genome. "Octopuses are highly intelligent creatures," says Claire Little, a marine biologist at the Weymouth Sealife Center in southwest England. "They're probably the most intelligent invertebrate that we're aware of. They are classed as intelligent as the general home pet dog." To read the rest of this short article, click on "Octopus Genome as Large as Human Genome".